We had a great deal of discussion when it came to applying for Ollie's first school last winter (in the UK the cut off date for school applications is mid January of the year your child is due to start school and the school year starts in September). It wasn't quite the discussion that goes on in most homes in the UK however, where after visiting every remotely local school and poring over OFSTED reports parents write down their order of preference and then wait for the intervening months to pass until they find out if they got their first choice. Our discussion focused on a different issue - was Ollie going to go to school at all, and if he was, what age should he start? I'm a teacher myself by training and experience, and as a child went to a wide variety of different types of school, all of which I enjoyed for the most part, but all with widely different ideologies, provision and academic expectation. So I wasn't coming to the table with any great angst over my own experiences clouding my thoughts, just a fair insight into what was available and what the issues are. Most children will enjoy school and will do well in school. School has a host of benefits, including well trained, well motivated teachers who genuinely care about their students and a good range of resources to aid learning. I don't intend this post to be 'school bashing' or to try to convince people not to send their kids to school. It's just an explanation of our choice given our individual circumstances. My first intention was that Ollie would spend a couple of years at the nursery attached to the school we thought would be a good one for him, based on a range of factors including a good provision of outside green space, good provision of resources, teaching which seemed good and a Head who seemed keen to provide challenge and stretch. What ensued was a year of Ollie screaming until he literally vomited every time I took him to nursery. The staff would have to drag him off me to get him into the room while he sobbed and promised to be a good boy (as though my abandonment was because he thought he had been naughty). 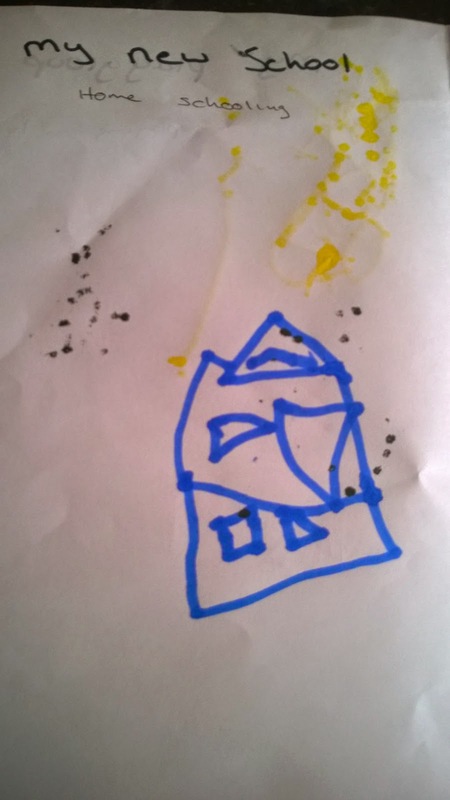 It broke my heart, but everyone around me said 'they settle down quickly when you leave', 'they need to do this so they're ready to go to school' and a host of other things that made me feel like an overbearing mummy making a baby of my child (he was 3). Alarm bells rang every time. His 'key member of staff' would say 'he settles down quickly when you leave - he goes for a nap under the play house'. A nap. Ollie. This didn't make sense as he never napped. I would pick him up early because he was exhausted by 2pm, often ravenously hungry even though there was food still uneaten in his lunch box, usually filthy, often with torn trousers. Eventually it all came together and I realised what was happening - he was 'napping' because he was utterly depressed, he was ravenous because no-one had helped him with his lunch, he often had a dirty bottom because no-one helped him in the toilet, he was dirty because no-one helped him put on an apron. He never brought home anything he had made. When I asked him what he had done he would say 'nuthin',.. 'who did you play with?'... 'no-one' which I knew wasn't true. One day I arrived to pick him up during story time - the staff had 50 or so kids in two groups sitting next to each other in the same room and were shouting different stories at them - my head was spinning after a few minutes. Yes he did often also have a good time playing with sand, or water, or on trikes outside, but his overall experience was of chaos without enough adults to make sure his basic needs for help and affection were being met - all within Government guidelines for ratios, but clearly not a nurturing environment for a child. I was given a recommendation for another nursery - this time with just 20 kids at a time with 4 or 5 adults. I got on the waiting list and when Ollie's place came up started him with just a couple of half days to see how he settled. It could not have been more different. Ollie was excited to get there in the morning, went straight in, when I picked him up he always had some art or food he had made. Despite the evidence of having done messy play, he was clean and dry. His lunch box was empty and his tummy full. He wanted to stay longer, so we rapidly extended to the two long days he does now - 9 to 4. His teachers can't believe that the confident, mature, happy little ring leader they see could have been a child who screamed like a banshee at the thought of going to his old nursery. He could not be happier - he tells me he wishes he could go there forever. Seeing how different he was in this setting sealed the deal for us in our schooling decision. It also made me feel like a complete monster - how could I have followed what others advised in the face of my own instincts and observations and have let my child be so unhappy, even if it was for 'just' two days a week? As far as we could make out, the problem with the other place hadn't been anything that could have been fixed by something like staff training, it just came down to the sheer number of children. By the time Ollie was due to go, the school would have expanded it's intake to 90 children in reception year - with part of the time in their own classes but a lot of 'free flow time' all together. Research shows that children learn best in small classes (wedging in TAs into a large class isn't as effective as one teacher in a small class), and that schools should have no more than 200 to 300 pupils, yet here we are with 30 in a class (I've taught up to 38 in a class myself while teaching science in a high school) in schools of 800 or more pupils. So size of class and school was the first issue. The next issue was age of entry. I believe that 4 is just too young for many children to be in a formal educational setting all day, five days a week. We still often have lazy Monday and Friday mornings at home, where even though we're up at normal times we do quiet things at home because the boys are recovering from either the busy weekend's activities or the equally busy weekday ones. Ollie is however generally a bundle of energy and isn't designed for sitting still and being quiet for any length of time - he is well above expected ability in reading, writing, numeracy but this takes a back seat to the more important business at this age of playing, running, stretching, rolling, climbing and doing all the things young children need to do to develop good co-ordination, strength, balance and social skills. Most schools have a play centred approach during Reception Year, but at age 5 in Year 1 children are expected to spend an increasing amount of time sitting still and concentrating. This isn't developmentally appropriate for many children, and I think especially not boys. From an early age they are therefore being fed the idea that there is something wrong with them because they can't sit still. A 5 year old isn't designed to sit still. Research into learning and achievement around the world backs this up - countries which delay formal education until the age of 7 have higher literacy and numeracy rates that those with an earlier starting age. This is a snapshot of our decision when it came to Ollie's education - and I say 'our' because it was really important that both Matt and I were happy with the decision. I leaned more pro home ed, Matt more pro school, but in the end we came up with a compromise that we think will work. We will follow the research and keep Ollie out of school until he is 7, at which point we will try to get him a place in one of the smaller village school outside our town but within a sensible driving radius of around half an hour. Class sizes may well still be up to 30, but at least the school overall will be a more manageable size for staff to get to know the kids as individuals. If Toby wants desperately to go to school when Ollie does, then we'll give him the option to try it, as we would if Ollie had seemed really keen to go this year. Eventually we will try to move out of town and find a new home close to the smallest secondary school in our area, avoiding the huge failing Academies which would be our current options. In the mean time, it is a continuation of what we do already - we learn through experience and through play, as well as sitting down for half an hour or so quiet time most days with one of Ollie's books to fill in activities on writing, numeracy, science, history etc... all just the ones that are available from the supermarkets. We read, three books at bed time, often more in the course of the day if one of the boys brings me a book to read to them. We sing learning songs and nursery rhymes. We watch videos online from time to time if that's the best way to answer a question like 'where does rubber come from'. 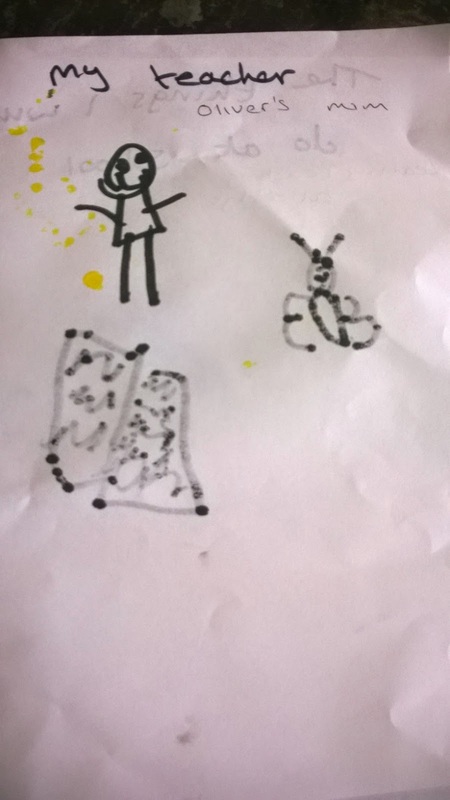 Ollie's current nursery time is coming to an end soon, and the staff have been wonderful in adapting their school transition program for Ollie's circumstances, as the pages he filled out in a transitions booklet this week show. 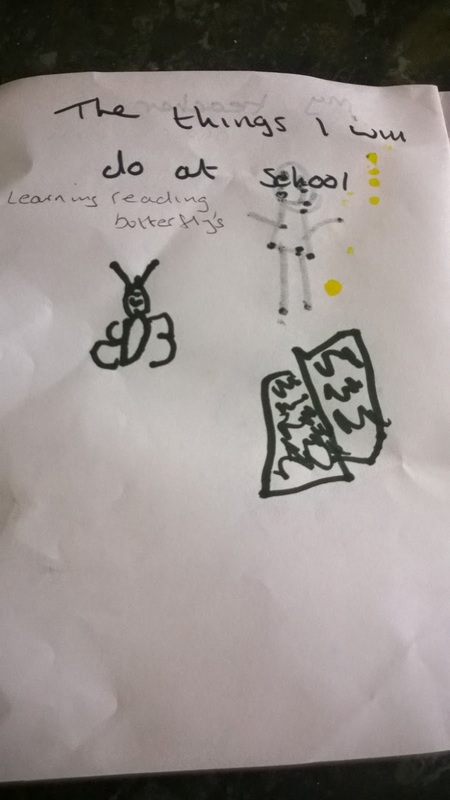 He certainly seems to have decided for himself what our curriculum will be composed of - learning to read and studying about butterflies apparently. A lot of friends and family have been supportive of the idea, especially after I pointed out that the socially acceptable thing for me to do would be to go back to teaching full time, hardly ever have any time to spend with the boys but be able to pay for them to go to private school if the local ones were too big or too bad to serve their needs. So why not cut out the middle man, teach them myself and actually get to spend a couple more precious years with the boys, while at the same time adhering to the good practice of the research that has been done? Others are less enthusiastic towards our choice, taking it a bit personally perhaps 'well it's all very well but some of us have to work full time'... full time school for 4 year olds is therefore actually free childcare - desperately needed by many working parents, but not automatically therefore what is best for every child. I have no judgement over other folks decisions - each child and each family circumstance is unique and we each make the decisions based on what is best for our families based on our circumstances. Maybe you have a great local school, maybe your child thrives in large groups, maybe you love the extra curricular activities that will be available and you own individual child is hugely independent and desperate to go to school, these are all brilliant reasons to send your child to school at 4. Maybe you are a single parent, or a couple on low incomes and the best thing for your family in the current economic climate is for your child to go to school at 4 freeing you up to bring in vital wages, that is a blooming good reason too. Sending them to school when you don't feel it's right for them just because that's 'what everyone else does' maybe isn't such a great reason. There are also bad reasons to home educate - fear of professionals becoming involved in your family, fear over pressure to return to work if your child is at school all day, fear about change in general, a misconception that this would be an easier option - talk to anyone who home educates, it is very much the hard option compared to dropping kids off at school for someone else to entertain and educate. The whole argument that you have to home educate because 'no-one understands my little Bobby, he's just high spirited' as he smashes things and swears at people - no, unless there's an underlying medical or mental issue, that's just bad manners and home educating won't fix it until you seek help in learning how to manage poor behaviour effectively. Kids can be free spirits without being obnoxious. Unless you are committed to putting in the work to provide a varied and interesting learning experience that will provide challenge and stretch, plus seek out every opportunity for your child to have access most days to other children and adults to socialise and play with, home education is probably not the right choice. The law doesn't say that children must attend school, but it does say that they must be receiving an education and plugging them into TV all day does not count as this. If you don't like studying and reading yourself home ed isn't your best option (and reading the home ed forums there's a surprising number of people out there trying to home educate while not enjoying study and reading themselves?!). Again, I don't want to sound like I'm judging other's decisions, but you can see my point I hope - home education should involve an actual education, whether this is through disciplined 'home schooling' or a more free-flow unschooled approach. Ultimately, send them, don't send them, send them later, find an alternative such as Montessori schooling, send them to a faith school, a small school, a forest school, to the moon - it's totally up to individual preferences but what we can all hopefully do is try to understand the decisions made by other parents and support each other because we are all just trying to do the best for our kids and every one of us needs the support of other parents one way or another.